Yeah, I know it’s still Thursday. But I’m out all day tomorrow (driving a friend and her daughter in for their appointment at the Children’s Hospital. She’s terrified of driving in the city and since we seem to like the Children’s so much, and I can do the drive with my eyes closed, she asked if I could take them) and I’m too lazy to schedule this to post in the morning. Anyway, this week has been a heavy week. Tributes to Maddie have flooded the interwebs. Some of them were so beautiful and touching. So I decided that maybe this weeks Follow Fridays needed to be something to cheer us all up a bit. I’ve got two great reads for you. One about how all the ladies on Twitter have penises (you just don’t know it yet) and the other is an example of why not everyone should be allowed on the internet. 2princessmama - Captured that classic non-twitterite attitude in her blog post ‘Twitter is Not Real‘. Which is exactly why I’m an elitist snob when it comes to Twitter…cause all the weirdos men pretending to be women cool kids are on it. There you have it. Frivolity all round. 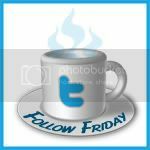 If you’d like to play along with Follow Friday , then write your blog post and link it up below so other people can find it. And if you’re so inclined, grab a badge.